Are we ready for the next flagship phone from Samsung? The Korean phone maker thinks so as they’ve announced a new Unpacked event that will happen on Monday, February 24 in Spain. Admittedly, the invite does not say anything about Galaxy S5 but the number 5 placed besides the Unpacked is good hint, isn’t it? The event will start at 8PM (CET) but Samsung says the gates will open from 6.30PM for the attendees. We’ll be there to cover the action live during MWC but like every other Unpacked event, Samsung will also stream it to the majority of the crowd on YouTube. If S5 will come with knox install I think I will still keep my S3Lte on custom rom, just because I can’t flash any custom rom on S5, because I need the warranty. To me that will be the biggest problem. I’m hoping the S5 will be a dissapointment for me (just like the S4 was, because it didn’t bring anything new or cool to the market), because my Note 3 is only a few months old and i’m perfectly happy with it, don’t want to change. Nevertheless if it has the “wow factor” like the LG G2’s ultra thin bezel and reverse-side-button design or the LG Flex’s durability then i will have to sell my Note 3 with a huge loss and buy the new gadget. Doubt that Samsung would make the same mistake like last year. Oh yeah! Bring on the Next Galaxy S(5) smartphone!! I still have my Galaxy S3. Need an upgrade! I have S3 and skip S4 because is with basically the same design, and nothing on earth could make me spend so much money for something slightly different. 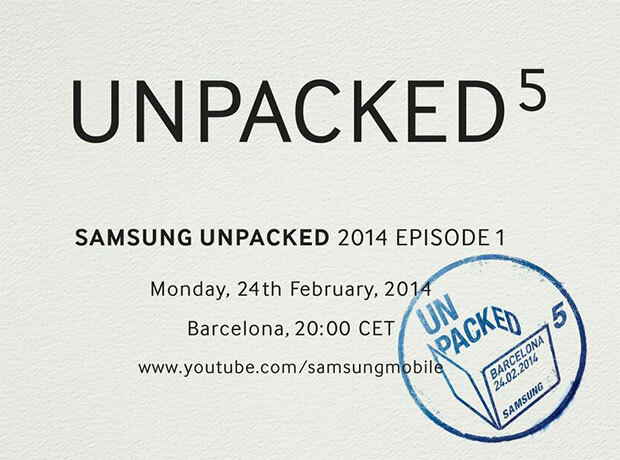 Must be the Galaxy S5… “Ready 4” gave us S4.. Samsung must have put that number for a reason. Also, based on the design of the invitation itself, it seems like S5 will have a new UX (like the screenshots you have posted of S Health, Life Times etc.) which looks like paper print. Matte off-white paper and clear clean black font. I hope it wont be too plain, because the Super AMOLED display is useless without some splash of color. Hope Samsung gets it right. And more metal would be nice too. #5 means episode 5 no more or less. Galaxy S5 will be shown in a separate event as usually.